This one I made with just olive oil, but some or all of the oil can be replaced with tahini or yoghurt depending on your particular tastes or allegiances. I'm fond of a tahini & olive oil blend myself. 2 Wash eggplant. Poke it a few times with a small knife. Place it on a baking dish or sheet and roast for about 45 minutes or until it softens and deflates. Let it cool completely. 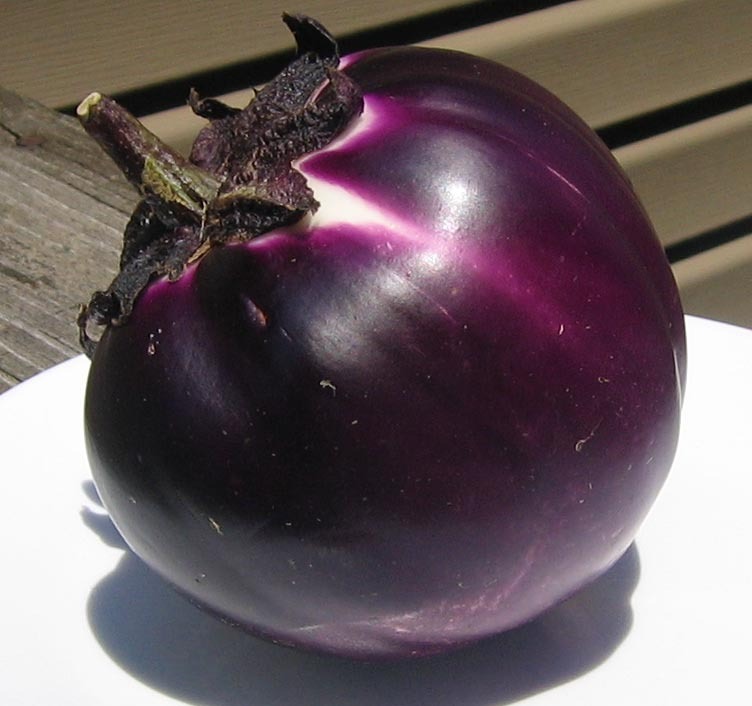 Note: You may also grill the eggplant - it adds wonderful flavor! It will take about the same amount of time on low-to-medium heat. Avoid high heat, it will char the outside without softening the inside. The time needed to soften will depend on the size and type of eggplant, with larger and denser ones taking longer. The eggplant I used (pictured) was an Italian Blue Marble. It's about the size of a softball or grapefruit, a little meatier and less bitter than the common black globe variety. 3 Peel or slice off the skin and charred bits. 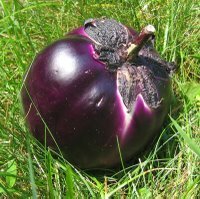 Combine eggplant pulp, onion, oregano, lemon juice, vinegar, salt, pepper, and cumin in a food processor and blend until homogenous, less than a minute. Stir the minced garlic into the oil in a small cup with a spout. While the processor is running, slowly pour the olive oil/garlic mixture through a chute until the dip is creamy. Add the parsley or mint and pulse a few times more. Notes: If you use tahini, add it in the beginning with the eggplant. I mix my garlic with oil to lessen its bitter taste and prevent the garlic from discoloring in the presence of acids. You can add fresh herbs in the beginning, but the longer you process, the greener the dip. 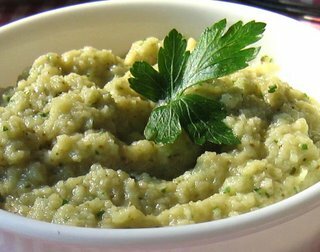 Baba ghanoush is usually served with pita bread, but any dip surface will do. Thank you for giving the general perameters for baba ghanoush (roasted eggplant mixed with an oil and seasonings) and describing several variations in adddition to giving your own specific recipe. This really helps someone learn how to cook in a given tradition or in a particular genre of food rather than just following a set recipe.